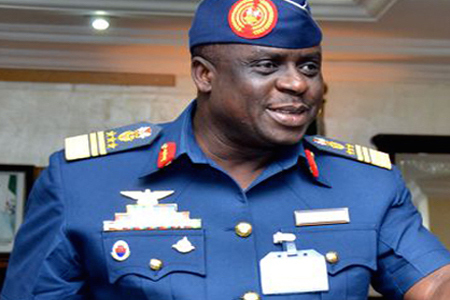 The Economic and Financial Crimes Commission (EFCC) has filed a money laundering charge against Air Marshal Adesola Amosu Nunayon (rtd) at the Federal High Court in Lagos. He was charged along with Air Vice Marshal Jacob Bola Adigun and Air Commodore Gbadebo Owodunni Olugbenga. Companies named in the charge are Delfina Oil and Gas Ltd, Mcallan Oil And Gas Ltd, Hebron Housing and Properties Company Ltd, Trapezites BDC, Fonds and Pricey Ltd, Deegee Oil and Gas Ltd, Timsegg Investment Ltd and Solomon Health Care Ltd.
EFCC accused them of converting N21billion from the Nigeria Air Force around March 5, 2014 in Lagos. They were also accused of concealing “proceeds of crime” and thereby committed an offence contrary to Section 18(a) of the Money Laundering (Prohibition) (Amendment) Act, 2012 and punishable under Section 17(a). The accused persons were accused of using the companies to convert and conceal the money. Air Marshal Nunayon and Air Vice Marshal Adigun were said to have, between July 17 and September 16, 2014, allegedly removed over N663.4million from the Nigerian Air Force accounts to purchase properties at 50-52 Tenterden Grove, London (NW4 1TH) and at 93B Shirehall Park, LondonNW4 2QU, United Kingdom. They were accused of buying 40A, Bourdillon, Ikoyi, with N900million, and a property at Sinari Daranijo in Victoria Island with N1.5billion. EFCC said they also bought a property named as Cappadol Mall at Adetokunbo Ademola Street, Wuse II Abuja, for N750million, as well as a property worth over N1.7billion at Agobogba Street, Parkview, Ikoyi Lagos, using the airforce’s money. Other properties they allegedly bought using Air Force’s funds include one at Salt Lake Street, Maitama, Abuja; one at Agadez Street off Aminu Kano Crescent, Abuja; 61A, Lake Chad Street, Maitama, Abuja; and one at 1, River Street, Wuse II Abuja using alleged stolen funds. Between last March 6 and April 30, the accused allegedly used N428,139,539.00 removed from the accounts of the Nigerian Air Force to renovate and purchase medical equipment for Solomon HealthCare Ltd situate at 24th Adeniyi Jones Street, Ikeja Lagos. Prosecuting counsel, Rotimi Oyedepo Isiokuwa, who signed the charge, said 42 witnesses will testify when trial begins.